The integrated ERP solution for the industrial production. LOOMDATA ERP helps to plan and optimize your human and technical resources. High level of integration (ERP / MES / MDA). Personnel management with personnel and shift planning. Powerful analytical applications for transparent business processes. Customized work sheets, material tickets or reports - user configurable - based on SAP Crystal Reports and SQL. Availability of resources (personnel, machinery, material, goods). Fully integrated material handling, warehousing and material requirement, with incoming goods. Determining and monitoring of supplier reliability. Proposal board for requirements of delivery. Optimized tools for creation of your sales documents. Access to warehouse stock and production in real time. Bundling of all sales activities, from offer request to invoice. The integrated LOOMDATA Costing module helps to get quick answers about material and production costs based on basic data. Multi-level costing model (Costing / Valuation-1 / Valuation-2 etc). Product costing / individual costing. Required raw material view (quantity and cost). Cost rates and cost rate groups for quick costing generation. Selectable cost rate references and cost rate units. Integrated costing module based on basic data. Planning basis for controlling department. Manufacturing order for continuous and individual production. Purchase of products, warehousing, material planning, valuation. Real-time production- and planning tracker. Tracing final products back to the raw materials. Hard- and Software for Planning and Machine Monitoring in Weaving and Weaving Preparation based on the LOOMDATA Product Family. Weaving order with detail planning by machine, multiple weaving articles and warps in parallel or one after the other. Warp change and setup time optimization. Reduction of down times. Graphical order tracking with dependency to weaving preparation. Multiple level exception reports. Weak point detection in shortest time. Production statistics by all important characteristics and time ranges. Information in shop floor on big screens. Integrated alarming system for quick interventions. Flexible shift and personnel planning. Production forecasts for warps, articles and pieces. Real-time monitoring and remote machine control with our hierarchical machine layout application. 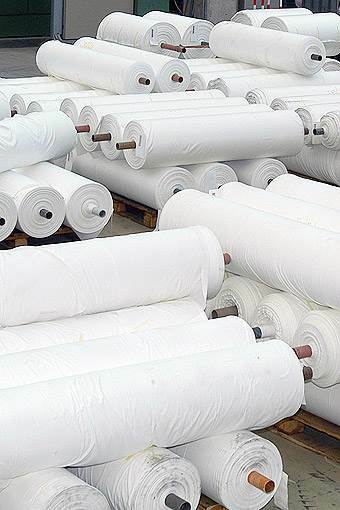 Warp yarn and weft yarn planning, reservation and delivery to the machines. Calculation of yarn requirement. Customized work sheets, material tickets or reports - user configurable - based on SAP Crystal Reports / SQL. Weaving accessory and spare part management, machine maintenance based on machine utilization. Hard- and Software for Planning and Machine Monitoring based on the LOOMDATA Product Family. Order with detail planning by machine. Style change and setup time optimization. Reduction of down times. Information in machine floor on big screens. Production forecasts for articles, pieces and yarns. Yarn planning, reservation and delivery to the machines. 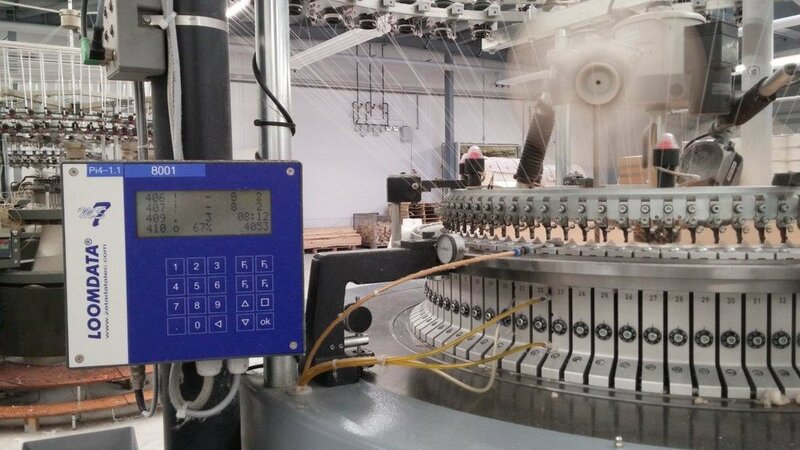 Calculation of yarn requirement. Knitting accessory and spare part management, machine maintenance based on machine utilization. Hard- and Software for Planning and Machine Monitoring in Finishing based on the LOOMDATA Product Family. Support for continuous and discontinuous processes. Sequence planing for bottle neck machines with adaptable decision criteria. Planned and unplanned machine passage; easy and flexible. Graphical order tracking; dependencies between orders and order steps. Planning, processing and tracing of batches. Batch creation, cutting, sewing, dyeing etc. Real-time acquisition of analog signals (pressure, temperature, power consumption etc). Machine terminal in two operation comfort levels; optional readers for Barcodes or RFID tags. Planning and monitoring of external finishing steps. Hard- and Software for Inspection and Quality Control based on the LOOMDATA Product Family. PC, touch-screen or machine station as user terminal. Flexible and powerful definition of defects by defect type, orientation, dimension and defect gravity. Inspection scheme driven input of measurements. Final quality evaluation - manually or automatically. Inspection of up to four pieces on one inspection table. Information about critical pieces running on the weaving machines. Extrapolation of defects in case of not fully inspected pieces. Evaluation by numerical or graphical piece reports. 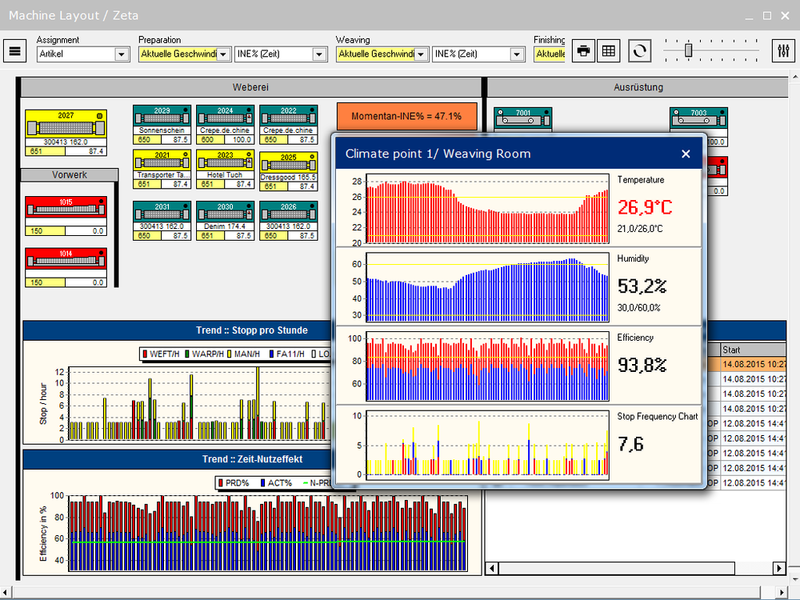 Hard- and software for machine monitoring in manufacturing companies based on the LOOMDATA Product Family. Connecting distributed production locations with centralized database, reliable and scalable server platform; support for virtualization based in VMware / vSphere. Support for endless and piece goods production, continuous and discontinuous processes, filling, packing etc. Flexible machine signal monitoring with our own hardware or by communicating with control unit of the machine itself (Ethernet, serial, VDI). Machine or group terminals in different operating comfort levels; optional readers for Barcodes or RFID tags. Evaluation based on shift-, machine-, item-, lot- or order-reports. Machine and device maintenance with spare part management. The LOOMDATA Product Family offers the maximum flexibility in connecting your machines. Our products are made in Switzerland. A convenient option of connecting all kinds of production machines, whether they are traditional (by sensors or signals) or modern ones (by serial communication). Simple handling by function keys. Customer-specific menu programming on request. High contrast LCD display and keyboard with 4 x 20 buttons and backlighting. Optionally with RFID readers for usage with contact-free RFID keys. Optionally with barcode scanners for safe and fast input. Signal detection via analog or digital inputs. Digital outputs to control external devices. Simple and maintenance-free alternative to the MS7. Input and output circuits with surge protection and current limitation. Various PI4 modules can be connected serially to one MS7 as group station. Versions with four digital inputs, four digital inputs and outputs, or analog inputs available. One of the biggest challenges in today's industries is the identification of material in different processes. This is one of the main principles for a process optimization and cost reduction. Material identification labels based on paper or much better RFID tags, help to establish this tracing. Identification by internal or external identification numbers. Manually and automatically printing of work sheets, labels or tickets. Identification of material with HF RFID along all type of processes. Mobile Computers from Intermec (formerly Motorola), Datalogic or Nordic ID for warehouse operations, etc. Tablets as personal digital assistants for information / declarations.